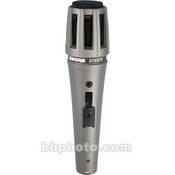 The Shure PG57 Dynamic Microphone is a very versatile microphone designed for amplified or acoustic instruments. Guitar, brass or drum, the PG57 gets your sound across without compromise. Convenient on/off switch for onstage control. Clamp and XLR microphone cable included. Shure PG57 Features Tailored frequency response is smooth and extended. Tuned specifically for instrument applications. Cardioid polar pattern picks up the most sound from in front of the microphone and some sound from the sides. Less susceptible to feedback in high volume settings. Dynamic cartridge has a simple, rugged coil. Handles extreme volume levels without distortion. Cartridge includes a neodymium magnet for high output level. Internal shock mount for reduced handling noise. Durable metal construction. On/off switch for onstage control. Hardened steel mesh tapered grille that resists wear and abuse. Includes a 15 ft (4.57m) cable, break-resistant mic clip and storage bag. SHURE PG58QTR Cardiod Microphone with 15 ft Cable A rugged microphone tuned to accentuate the clarity of lead and back-up vocals. QTR Version comes with 15 ft. cable. (XLR-1/4) Features: Tailored frequency response is smooth and extended. Tuned specifically for vocal applications. Cardioid polar pattern picks up the most sound from in front of the microphone and some sound from the sides. Less susceptible to feedback in high volume settings. Dynamic cartridge has a simple, rugged coil. Handles extreme volume levels without distortion. Cartridge includes a neodymium magnet for high output level. Internal shock mount for reduced handling noise. Durable metal construction. On/off switch for onstage control. Hardened steel mesh ball grille that resists wear and abuse. Integral "pop" filter reduces explosive breath sounds and wind noise. Includes 15ft. (4.57m) cable, break-resistant mic clip and storage bag.